Alissa Jackman is a Violin major at Fiorello H. LaGuardia High School of Music, Art, and Performing Arts in New York City. She first picked up a violin at age 3 and has loved it ever since. Alissa’s first experience with the Electrify Your Strings Program was in 2009. She has played multiple shows with the EYS program and was interviewed, with Mark Wood himself, on ABC about the program. She has also performed in various fundraising concerts such as the Electrify Your Music Foundation kick off concert featuring Dee Snider, and the MuzArt World Organization’s “We Are Hope” concert. She has been attending the Mark Wood Rock Orchestra Camp since 2011. 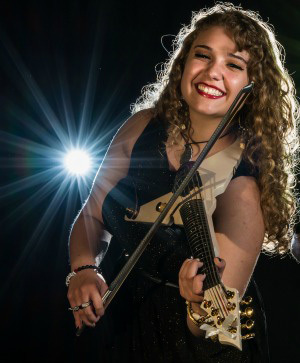 Alissa is passionate about her music, proud to be part of the Wood Violins family, and is excited to see how far her growing music career will take her.